After spending a few days in Sydney, Cape Breton Island's largest city, we felt that it was time to discover why Nova Scotia declares Cape Breton Island, 'the masterpiece where your heart will never leave'. One could feel the cleanliness of true nature and the goodness of humanity. Cape Bretoners exude hospitality at its best making visitors feel like family. Here in Sydney there is also something else special: the harmony between First Nations Peoples, the Mi'kmaq and all others working hand in hand to create a haven of mutual respect. Cape Breton, although expanding rapidly, retains its historical roots in its culture, traditions, and cuisine. At a banquet that we recently attended for Canadian travel writers, the dinner began with Mi'kmaq dancers and songs, followed by the Elders' blessings for conference participants to remain safe, healthy and to be protected by good spirits. The silence when Dan Christmas, a member of the tribal council, speaking on behalf of Chief Terry Paul, spoke to the delegates was deafening. In awe of his presence they took to their feet standing in respect for his holy blessings and as he greeted all members of his tribe. As if the antagonisms of history were erased. The Islanders have emerged with the Mi'kmaq peoples, celebrating their Scottish, Irish, and French Acadian heritages together. Membertou, a reservation in Sydney, is a living example of this fusion of peoples, industry, hospitality, and touristic venues. While Sidney has its lure, Cape Breton has many other attractions. 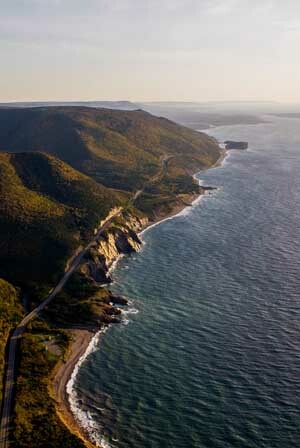 Chief among these is the Cabot Trail, a scenic roadway encircling the Island. Tourist literature describe it as a place that makes one believe in magic. And so it proves so. 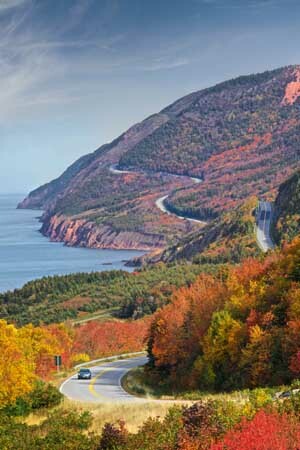 The Cabot Trail is one of the most renowned panoramic trails in Canada, its route covering the greater part of Cape Breton Island. Overwhelming to see are the breath-taking natural attractions. There are vantage points along the trail offering picturesque views of the purity of the land and its baskets of colour. Then, of course, Cape Breton National Park with its seductive scenic driving areas, is a safe and relaxing haven for campers and for all of those who wish to sleep with the stars overhead and to awake with the morning dew and rising sun. To experience the pulse of the Island's history is to visit the fishing villages that hug the coast. For those who enjoy hiking and biking, the Trail is the El Dorado for these adventures. Some of the most important stops on the Trail are: Chéticamp, the largest village on Cape Breton's Acadian coast; Pleasant Bay for whale watching; Ingonish and the beaches for water sports, and scenery; and the Alexander Graham Bell National Historic site located in the quiet village of Baddeck. Baddeck with a population of 900 set in green forests and edged by deep blue waters of a shimmering bay, is the jewel of Cape Breton. It is at its best bursting with colours from the spring to autumn seasons and best enjoyed along its downtown shopping area bedecked with baskets and boxes overflowing with flowers, ivies and all things colourful to celebrate the blossoming warm seasons. With its identity as a bustling resort town during its high seasons, its special character remains as a quaint village. Rather than tourists changing the face of this destination, Baddeck turns the tourist into a Baddeckian re-born - calm, at ease with nature, enjoying the cleanliness of unadulterated water, all in a serene atmosphere. Outdoor activities abound - sailing regattas, bird-watching, hiking, biking, fishing, horseback riding and in the winter, even dog-sledding. There are many activities enjoyed by all ages and wonderful venues for family getaways. Even Baddeck's theatre productions or Ceilidhs are embedded in the culture of the village. Held during the evenings, the lively performances are reminiscent of the bygone days of public theatre. Go ahead and ask anyone in Baddeck about events and sites because in this centre of the Cabot Trail, it is also the home and heart of hospitality of Cape Breton. 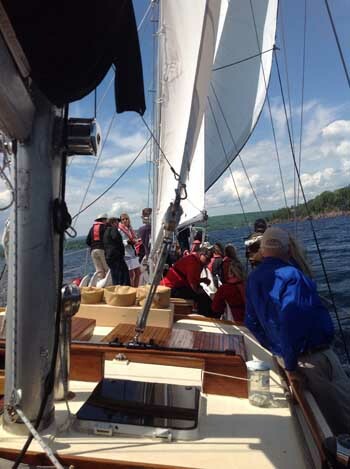 We had come to Baddeck to sail for a while on the rolling waves of the Bras d'Or Lake, the largest inland sea in Canada. Soon we were comfortably seated on Captain John Bryson's schooner, named the Amoeba, a 20m (67 ft) hand-crafted vessel. After sailing for a few hours soothed by the cool breezes and being entertained by Captains John's jokes, a good number of the passengers left for the Alexander Graham Bell National Historic Site. A national hero of Canada but Nova Scotia's pride is Alexander Graham Bell. So celebrated is this genius of invention that the province, working in unison with Cape Breton Island, founded the museum. It is an exhibit complex that contains models and replicas of Bell's inventions, photo displays, and artifacts. 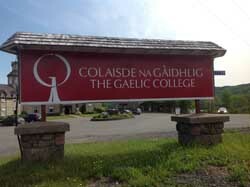 The next day, a short distance from Baddeck, we stopped at a unique establishment, the Gaelic College or in Scottish Gaelic Colaisde na Gàidhlig, a non-profit institution founded in 1938 to promote and preserve Highland Scottish Gaelic language, culture and traditions. At one time, Scottish Gaelic was spoken by over 100,000 Nova Scotians but by the 1930's it had almost disappeared. Today, thousands of students from all over the world attend the College's courses throughout the year. In addition, it is also the home base for the Cape Breton Fiddlers' Association and participates in the Celtic Colours International Festival held annually in October. For 2016, this will be the festival's 20th anniversary and it promises to be spectacular. Our next stop was the Fortress Louisbourg, a partially rebuilt 18th century French fortress, captured twice by the British. After the second surrender the British razed the citadel. In 1961, with the help of a huge grant of $25 million dollars by Prime Minister Diefenbaker's government and by employing the idle coal miners of Cape Breton, one-fifth of the fortress town was reconstructed according to its original blueprint. After the completion of this reconstruction, it has been a tourist mecca drawing visitors from the four corners of the globe. It is a unique strange place. 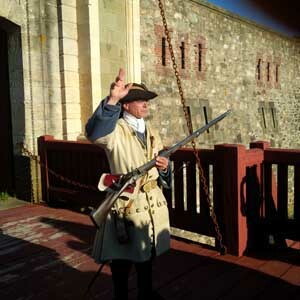 As we entered the gates of the fortress, a sentry stopped us asking the purpose of our visit. My daughter answered: "We've come here to take over the Fortress. Since you're dressed in period attire, I may as well repeat history with a new conquest!" Obviously not accustomed to her humour, the sentry taken aback for a moment, laughed and motioned our group to enter. The customary coldness of sentries had melted. After 'living' in this 18th century citadel for a while we left to return to the 21st century to set out on our next mission of checking out breweries and distilleries. There seems to be a plethora of craft beer breweries springing up all over Canada. 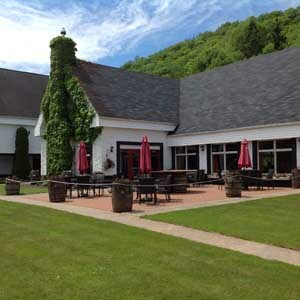 Like wineries, these breweries are dotted across the country and have reached Cape Breton. On our way to the Glenora Inn and Distillery, we stopped near Baddeck at a craft brewery to sample their beer. 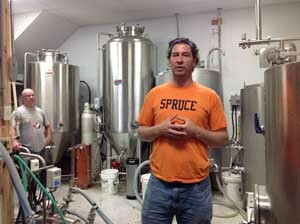 There at the Big Spruce Brewing Company we met Jeremy White, owner and creative brewer. Having created at least a dozen types of unfiltered, unpasteurized and excellent beer, Jeremy enjoys his vocation as he has the opportunity to experiment and offer the world the best of what nature can bring to brewing. After a tasting session of his beers, and early morning to boot, we headed on to Glenora where we were to try our hand at becoming malt whiskey experts. It wasn't a contest to determine whether beer or whiskey are better, it was to introduce us to the flavours of Cape Breton. Arriving at Glenora, we walked through an entrance into an almost village-like setting. White buildings, green lawns, shrubs of all sizes, and trees swaying with the breeze, all perfectly manicured and the sounds of brook water made for a storybook scene. We were greeted by friendly staff who led us to the taste-testing area where we were introduced to 5 types of whiskies. By the time we finished, most of us could hardly stand but we all had smiles on our faces. We enjoyed a magnificent lunch in the dining room of the Inn. Scallops, lobster, smoked trout and their trimmings made Glenora a place to remember. Everything was so fresh and so tasty with ingenious combinations of herbs, vegetables and sauces. It was a great ending to our tour of southern Cape Breton, a paradise-isle for which Ulysses missed out on. 1) It is best to have your own car or rent an auto when visiting Cape Breton. Taxis are rare and beware gas stations are a few and far in between. The region of Peterborough and the Kawarthas is a tourist destination par excellence.